This reflection refers to the readings for Sunday, Novmber 3, 2013. For last week’s reflection, click here. Zacchaeus is a wonderful story of the working of grace. The first move seems to be Zacchaeus’s: he climbs the tree. And yet the detail of him climbing the tree just emphasizes that something miraculous is happening in Zacchaeus’s soul. He was not a good man. What made him climb the tree? The attraction of Jesus – the power of grace, moving in his soul. The first move is not Zacchaeus’s. It is Jesus who comes to seek and to save. Similarly, though Zacchaeus repents, and repents powerfully – “half of my possessions, Lord, I shall give to the poor, and if I have extorted anything from anyone I shall repay it four times over” – the power of that repentance itself emphasizes the miraculous attraction of Jesus. This doesn’t just happen! It is precisely the presence of Jesus that transforms Zacchaeus’s heart. The same dynamic explains intercessory prayer, the theme of the reading from Second Thessalonians. “We always pray for you, that our God may make you worthy of his calling.” This is a remarkable statement. It is God who makes us worthy. It is God who transforms our hearts. Conversion is a kind of miracle. That is precisely why we can pray for people. We don’t just pray that a dozen eggs will appear at their front door. We can also pray for the conversion of their hearts. Because the God who created their hearts can convert their hearts. In fact, only God is powerful enough to overcome our selfishness. Paul concludes with a nice formula. “That the name of our Lord Jesus may be glorified in you, and you in him.” Which one is it? As with Zacchaeus, so with every conversion: it is God who turns us, and we who turn. Zacchaeus really does repent: he repays the people he has cheated, he climbs the tree, he sets out on the way of faith. But it is Jesus who makes that happen in him. We mustn’t have false dichotomies, where a work either belongs to God or to us. It is God who works in us. The result of God’s grace is that Zacchaeus converts. God is merciful because God is powerful. On the one hand, our sin doesn’t hurt God: all of creation is like nothing next to him. Sin hurts me, not him. God can overlook sin because it doesn’t hurt him. But in another sense, he can’t, and doesn’t overlook sin. For my heart to be turned away from God is bad for me. It’s not a question of whether he “minds.” Sin hurts me. God’s mercy is not to ignore my sin. In fact, God’s mercy is precisely that he does not overlook sin: he heals us. He comes to seek and save the lost. And he is powerful enough to do it. “You love all things that are . . . for what you hated, you would not have fashioned.” God created us because he loves us. He has absolute power over us – but precisely that power shows forth his love: he only made us because he wanted us to exist. Jesus made Zacchaeus – so it is no surprise that he comes to save him. “Therefore you rebuke offenders little by little, warn them and remind them of the sins they are committing, that they may abandon their wickedness and believe in you, O LORD!” Not for his sake, but for ours. He made us for happiness, and wants to bring us to his perfect happiness. Repentance is a gift. How have you come to realize that sin hurts you? And how have you come to realize that it is God who has come to heal you, not you who heal yourself? Last week we considered Elizabeth’s words to Mary: “blessed is the fruit of thy womb,” but we only considered the blessing part: we bless Jesus. This week let us consider the remarkable way she describes Jesus: the fruit of Mary’s womb. Similarly, rather than dismiss “fruit of thy womb” as just a quaint way of saying “baby,” we should consider why St. Elizabeth, in the prophetic state of being “filled with the Holy Spirit” (Luke 1:41), used this expression. The Hail Mary, in fact, is an encouragement to meditate on these words: not to skip over them, but to ponder them, over and over, day after day. “Fruit of her womb”? St. Thomas has an almost quaint meditation on the word “fruit.” The fruit of a plant is two things. First, it is the culmination, the perfection. An apple tree grows and matures – until it can bear fruit. That’s the whole purpose of its existence. The word “flourishing” is similarly beautiful: something is literally flourishing when it is in flower. That is the sign of a healthy, adult plant. So too Jesus is the flourishing of Mary, her perfection, her culmination. This is what she was made for. This is the flourishing of humanity: to bring Jesus into the world. Mary has born fruit! But second – and even more quaint, almost – St. Thomas points out that fruit is sweet. The same can be said of flowers. Modern science can sometimes get us into an over functional account of these things: The fruit is sweet so that birds will eat it, and poop out the seeds. But let us not miss the gratuitousness of a plum, or a rose: just plain wonderful, sweet. So too the fruit of Mary’s womb. Not just a product, a fruit. Jesus is sweet! In fact, one of the tradition’s favorite hymns, maybe written by St. Bernard, is Jesu Dulcis Memoria: “Jesus, sweet to the memory | giving true joy to hearts | but even sweeter your presence | beyond honey and all else.” We should think of Jesus this way: sweeter than honey, the perfect fruit. That is the deepest theology of Jesus: he is the one we enjoy. But there is another theological angle on “fruit of thy womb.” It is a statement about Christology. In a couple weeks we will discuss the most proper theological statement of the truth. “Mother of God” is the perfect culmination of the Christological debates: Jesus is truly God, he is truly man (and thus son of Mary), and there is but one Jesus, not one “part” who is son of Mary, and another who is son of God. But even finer are the biblical anticipations of this title in Elizabeth’s prophetic words to Mary: “Blessed is the fruit of thy womb. And whence is this to me, that the mother of my Lord should come to me?” (Luke 1:42-43). Anyone familiar with the Old Testament – and Elizabeth is the wife of a priest – knows that “Lord,” Adonai, is the word devout Jews used in place of the unspeakable name YHWH. “The Mother of my Lord” means “the Mother of YHWH.” This says even more than the later theological title, “Mother of God.” Luke 1 uses “Lord” to mean YHWH no fewer than fifteen times. But in “fruit of thy womb,” Elizabeth encourages us to go deeper. To contemplate the depth of the connection between YHWH and Mary. As in all Marian spirituality, the point is not to exalt Mary. The point is to meditate on how close God has come to us. YHWH himself has not only lain in Mary’s womb, but become the fruit of that womb. Sweeter than honey. How do you appreciate the closeness of God in Jesus? How do you savor his sweetness? Click here for the entire “Hail Mary” series. We have spent the last seven weeks considering the seven cardinal vices: gluttony, lust, avarice (or greed), sloth, wrath, envy, and pride. This list is the product of centuries of spiritual direction by men who knew the Bible, loved the Church, and seriously pursued their own spiritual life. The list varies somewhat. John Cassian gave the first classic list, in his The Institutes of the Desert Fathers , a book written in the early 400s to introduce monks in France to the wisdom of the monks in the Egyptian desert. The desert fathers were the first great spiritual heroes of the Christian tradition. For over a hundred years, they had been both praying and talking to one another: a central aspect of the wisdom of the desert was the willingness to learn from others. Cassian uses the image of a bee flying from flower to flower, collecting what each distinct flower has to offer. The point is that no one has all the answers; we get real wisdom by listening to all the great voices. Sometimes I think modern ideas of spiritual direction can lose some of this richness. In the wisdom of the tradition, no one person knows everything. The “grace of state” that is sometimes evoked now as justification for total submission to a single spiritual director is an idea with no grounds in the Catholic tradition: it is purely modern. Even spiritual direction itself is a concept never once mentioned in the theology of St. Thomas Aquinas, and, so far as I have been able to tell, not practiced in the modern submission-to-one-teacher way until quite recently. My point is not that we shouldn’t have spiritual directors – a spiritual director or regular confessor can be very helpful. The point is that we must go searching for wisdom, and the wisdom of the tradition; no one person can just give us all the answers. “Now, we have written this Rule that, observing it in monasteries, we may show that we have acquired at least some moral righteousness, or a beginning of the monastic life. In other words, St. Benedict too was a “bee,” drawing from everything he could, especially Scripture. He does not present himself as the end, but as a beginning. Gregory read Cassian, as Benedict taught, and came up with his own version, narrowing Cassian’s list of eight vices to seven. (He combined Cassian’s sadness and distraction into sloth, and vainglory and pride into just pride, and added envy.) What we find here is an active mind: thinking about Scripture, learning from the fathers, paying attention to his own and others’ spiritual lives, and using authority to go deeper, not just to sign off on a dead list. In the end, the spiritual life is very simple: Love God with all your heart and soul and mind and strength, and therefore love your neighbor as yourself. That’s all there is to it. What lists like this list of seven can help us do is to appreciate better what true love looks like, and how we often fail to love. The saints who have gone before us simply point out some of the ways we might miss the mark. How do you travel like a bee from flower to flower? How do you practice gathering the wisdom of Scripture and the Tradition? This reflection refers to the readings for Sunday, October 27, 2013. For last week’s reflection, click here. SIR 35:12-14, 16-18; PS 34: 2-3, 17-18, 19, 23; 2TM 4: 6-8, 16-18; LK 18: 9-14. We are often told to think of mercy and justice as opposites. My kids just found a Protestant tract saying we are doomed if God is just. The first problem with this view is that it is completely un-Biblical. In the Bible we are taught to love God’s justice, to seek it above all. The second problem is that it makes nonsense of Jesus. If God’s “mercy triumphs over justice,” then it makes no sense for him to be just sometimes and not just others: why the Cross, why the threat of Hell, if his justice is an evil just to be pushed away? The full line about “Mercy triumphs over justice” says, “Judgment will be merciless to one who has shown no mercy; mercy triumphs over judgment” (James 2:13). What he is saying is that we should be merciful if we want to be just – because God is just, and will judge us on our mercy. Our first reading, from Sirach, says, “God is a God of justice.” Don’t be fooled by those who say this is the “Old Testament God,” conquered by the “New Testament God” of mercy. There is only one God – and Jesus himself says he will come in judgment. The emphasis here is on God’s impartiality. God does not play favorites. Whether you are rich or poor, you will be treated fairly. Whether you are in the in crowd or the out crowd, you will be judged justly. Christianity is not a chance to triumph over God’s justice; the Bible insists, over and over again, that God “knows no favorites.” Being part of the family does not triumph over justice. On the other hand, “he hears the cry of the oppressed.” In the courtroom metaphor, that means he is not like the judge who only gives you justice if you can afford a fancy lawyer. We all have an advocate before the Father. But also, in prayer, he will come to help whoever asks for his help. St. Paul discusses both sides of this dynamic in our second reading. “The crown of righteousness awaits me, which the Lord, the just judge will award me.” St. Paul believes he has earned this crown. How has he earned it? By “being poured out like a libation.” (A libation, or “drink offering,” is a sacrifice of wine, symbolic of our life blood, poured out on the ground.) By giving his whole life. God is just: he “rewards” those who give their whole lives to him. Then where is mercy? “The Lord stood by me and gave me strength” – even when everyone else abandoned Paul. God’s mercy does not come after his judgment, cancelling his justice. It comes before, making us just. God’s mercy is in justification. This is what Catholics mean by grace. Grace is not, as in Protestant theology, God “covering” us or overlooking our faults. It is God fixing our faults, actually making us better. This is why Our Lady, full of grace, is so important: to see what grace does. Grace gives us strength. But the deepest part of this justice is the fulfillment of our desires. “The Lord, the just judge, will reward me on that day, and not only me, but all those who have longed for his appearance.” This is the real inner core of “being poured out like a libation.” It is not that Paul has earned heaven by something unrelated to heaven. It is that those who want heaven, and live as if they want heaven, receive it. God’s mercy is the grace that makes our hearts long for his face. This is the inner core, too, of Sunday’s Gospel, about the Pharisee and the tax collector. The Pharisee fasts twice a week, and pays tithes on his whole income. Good for him. “Woe to you, scribes and Pharisees, hypocrites!” Jesus says elsewhere. “You pay tithes of mint and anise and cumin, and have omitted the weightier matters of the law, judgment, mercy, and faith: these you ought to have done, and not leave the other undone” (Matthew 23:23). The problem with the Pharisee is not that he cares about justice instead of God’s mercy. The problem is that he isn’t just, and he doesn’t care. He isn’t pouring himself out like a libation, because he doesn’t long for the Lord’s appearance. He worships himself, not God. The one who really longs for God will live a life of mercy: works of mercy to others, and begging the mercy of God’s grace, to make him truly just. How do you appreciate God’s justice? How do you beg his mercy? Part 6 in our series on the “Hail Mary”. I am late on this week’s post because we had a baby Saturday morning. Welcome, Catherine Rose! “Blessed art thou among women, and blessed is the fruit of thy womb.” Elizabeth’s words make a parallel between the way Mary – and we – are blessed and the way Jesus is blessed. He shares his blessings with us. Our blessing is no less nor more than his. It flows from his blessings, and then returns back to him. 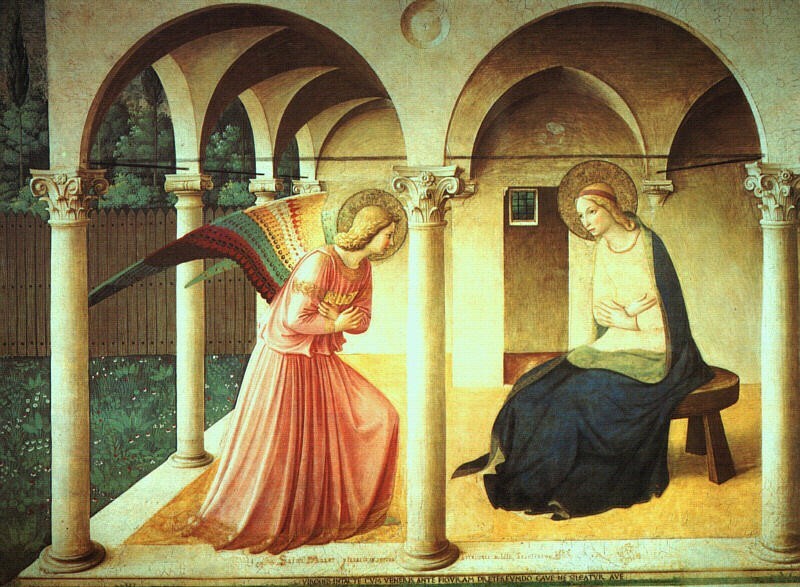 This too can be called the very heart of the Hail Mary, and the heart of the Gospel: to say, “Blessed is Jesus.” We pray this through all the mysteries of the Rosary: Blessed is Jesus, announced to Mary, and incarnate in her womb; visiting through Mary the visitor; born in poverty; presented by Joseph and Mary; found in the temple. Blessed is Jesus in agony, scourged, crowned with thorns, carrying the cross, crucified and dead and buried. Blessed is Jesus sending the Holy Spirit, carrying his mother to heaven, crowning Mary. Blessed is Jesus proclaiming the Kingdom, transfigured, giving us the Eucharist. This is, in fact, one of the traditional methods that St. Louis de Montfort recommends to make our rosaries bear real spiritual fruit: to add after the name of Jesus a very brief description of the mystery we are praying, “Jesus, baptized in the Jordan.” If we do nothing else in the rosary but bless Jesus in each of the mysteries, we will have drunk deeply. And of course we can add other words. Blessed be Jesus my faith, my hope, my love. Blessed be Jesus in this trial, in this small victory, on this happy day, as I begin my work. Or just blessed be Jesus, whenever we can pray. This is the heart of the Hail Mary. And, conversely, to surround this blessing of Jesus with the Hail Mary is to enter more deeply into it. Because above all, we pray, Blessed be Jesus, who brings joy (Ave!) to Mary, who fills her with grace, who is with her. Blessed is Jesus who makes her holy, who is her child. Blessed is Jesus to whom Mary prays for us sinners, now and at the hour of our death. Blessed be Jesus! Let us carefully invoke his holy name, and so discover the riches of the Hail Mary. Blessed is Jesus: this is the content of heaven. “I saw also the Lord sitting upon a throne, high and lifted up, and his train filled the temple. Above it stood the seraphim: each one had six wings; with two he covered his face, and with two he covered his feet, and with two he flew. And one cried unto another, and said, Holy, holy, holy, the Lord of hosts: the whole earth is full of his glory” (Isaiah 6:1-3). “And the multitudes that went before, and that followed, cried, saying, Hosanna, to the Son of David: Blessed is he that comes in the name of the Lord; Hosanna in the highest” (Matthew 21:9). “And I beheld, and I heard the voice of many angels round about the throne, and the beasts and the elders; and the number of them was ten thousand times ten thousand, and thousands of thousands; Saying with a loud voice, Worthy is the Lamb that was slain to receive power, and riches, and wisdom, and strength, and honor, and glory, and blessing” (Revelation 5:11-12). “Holy,” “Glory,” “Blessed,” “Hosanna,” “Worthy.” There really is nothing else in heaven to prepare for than to bless Jesus. In heaven we will do nothing but bless him forever. Praying the Hail Mary well – praying “Blessed is Jesus,” with the words that surround and emphasize that central affirmation – is practice for heaven. It is worth considering how the rest of our lives prepare for heaven precisely insofar as they participate in this blessing. The Commandments mark out things completely inconsistent with blessing Jesus. But really to bless him is to be patient and kind; not to be envious, or puffed up; not to seek our own, but to rejoice in the good (1 Corinthians 13). To bless Jesus in all things. How do you bless Jesus, in your prayer and in your work? St. Thomas Aquinas defined mercy as “the compassion in our hearts for another person’s misery, a compassion which drives us to do what we can to help him” (ST II-II.30.1). Part 7 in our series on the vices. We come now to the deepest vice, pride. 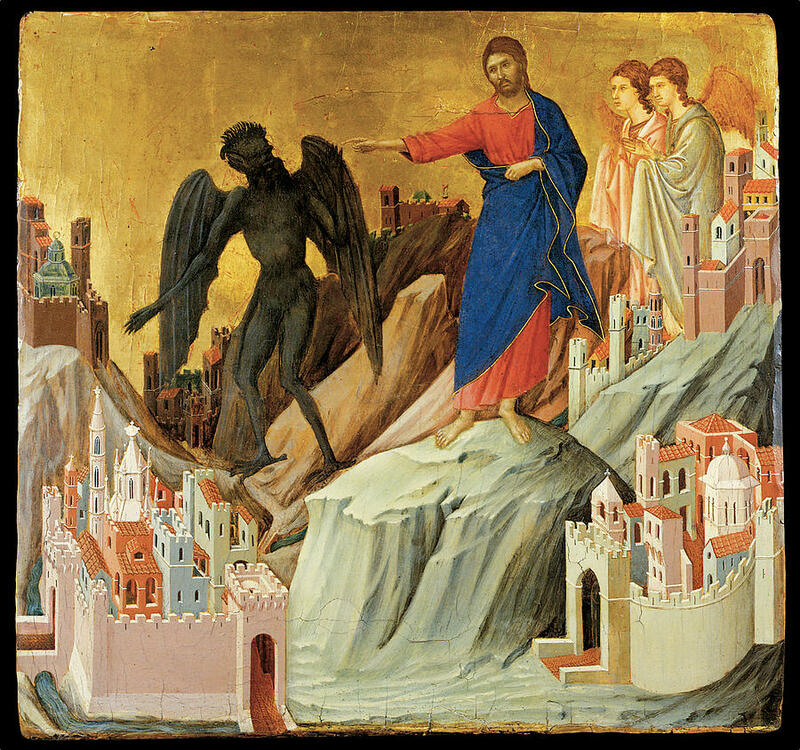 I said last week that envy is close to the sin that brought down Satan, who could not stand to see Jesus and Mary elevated. But in fact the heart of the spiritual life, and the heart of sin, is more directly related to God. The first sin, the Tradition insists, was not against neighbor, but against God. Lucifer said, “I will not serve,” and Michael responded, “who is like God?” Lucifer, it is conjectured, was the highest of all the angels. Everyone else could accept being second. Lucifer wanted to be first. Michael was not the highest of angels – in fact, in the traditional scheme, archangels are way down toward the bottom, little more than messengers, while the Cherubim and Seraphim stand around the throne. But Michael triumphs because he knows that God is God; no one is like God! Micha-el is just Hebrew for the question “who is like the Almighty?” To ask ourselves this question is the greatest battle cry of all. On the one hand, this is about worship. The “serve” in Satan’s cry – non serviam! – is actually the Latin word for worship. I will not worship. That is the heart of pride. To which the response is: but who is like the Almighty? On the other hand, it is about grace. Satan does not want to receive, he cannot tolerate the idea of grace. To which, again, the response is: but who is like the Almighty? Who could provide for us like God? What could be more wonderful than to receive what God has to give us? The fall of Satan is nothing other than the corruption that comes when the most brilliant intellect suddenly becomes foolish. How foolish to think that you can stand in the place of God. This is fundamentally what it is all about. To acknowledge God as God, to worship him and to receive the gifts he offers. From the beginning, God has given us signs of this worship. Adam and Eve were told not to eat of the tree. The point is that lower actions can symbolize our relation to God. To receive his law is to let ourselves be in a position of receiving. The battle against pride is played out on all sorts of symbolic levels. The deepest part of the moral law is simply the acknowledgement that God is God. He created the world, he made its order. To reject nature is, above all, to reject nature’s God. To think that we are better than God. But who is like God? The great spiritual writers give us other concrete ways to practice humility. Cassian, the collector of the fourth-century Desert Fathers, suggests we offer and accept apologies; that we be kind to the people around us; that we submit to the wisdom of our elders, and the needs of our community. These are all goods in themselves. But the bigger point is that these are ways we can practice knowing that we are not God. No, mine is not the greatest wisdom. No, an offense against me is not the greatest offense. No, vengeance is not mine. St. Benedict gives us some harsher practices. To keep our voices down; not to assert ourselves over much; even to avoid being too uproarious in our sense of humor. These ideas drive my students crazy. But the point is that self-worship is so very easy. So easy to insist that everyone look at me! Now, humility is only ever a secondary thing – and these steps to humility are second to that second. Being boisterous or not is not the main point. But the point is to practice recognizing that God is God: he is the good, he is the healer, his is the wisdom. This is not exactly self-contempt. In fact, it is a focus on his mercy. But to focus on his mercy requires being willing to receive, not always asserting ourselves. And finally, we look to Mary. She is the handmaid of the Lord. She is full of his grace. She receives everything from him, gives everything to him, and is nothing without him. She is simply “with the Lord.” To love Mary is to discover the heart of humility. How do you find yourself placing yourself in the place of God? And how do you step back and let him be God? This concludes our series on the vices. Click here for the rest of the “vices” series. This reflection refers to the readings for Sunday, October 20, 2013. For last week’s reflection, click here. 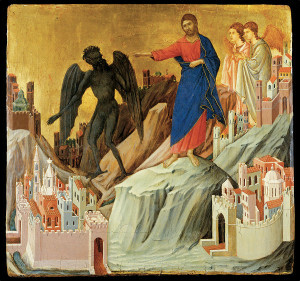 This Sunday’s readings are about grace – or, more to the point, our devotion to God’s grace. From Exodus we have the great, almost comical picture of Moses holding his hands up while Israel fights against Amalek: “As long as Moses kept his hands raised up, Israel had the better of the fight, but when he let his hands rest, Amalek had the better.” When Moses gets tired, he sits down and has his friends hold his hands up. Comical! But sometimes these vivid images stick with us. The point, of course, is that victory comes not through strength, but through prayer. The Psalms say this over and over again: “You, by your hand, expelling the nations, have planted them . . . Nor was it by their sword that they occupied the land, nor did their arm save them, but your right hand and your arm, and the serenity of your face, for you loved them” (Psalm 44). The constant military imagery of the Psalms might be disturbing. But it makes two points: first, there is a war, a real battle of faithfulness. God really does save us. Second, it is social: God saves “a holy nation, a royal priesthood, a people set apart” – not just scattered individuals. In addition, of course, it shows that grace works in us: “Joshua mowed down Amalek and his people.” God makes it happen: but he makes it happen in us. But the reading from Exodus adds something to this teaching about grace: something about how we experience grace. It is not Moses’s friends who win the war. And yet leaning on his friends is a sign to him of God’s Providence. Trusting in others is a way we can experience and express devotion to our trust in God. The reading from Second Timothy gives us another way to express devotion to God’s grace: through trust in Scripture. It is not exactly the case that God can speak to us no other way than through Scripture. His Spirit can also inspire us “for teaching, for refutation, for correction, and for training in righteousness.” In fact, people often do these things without Scripture. But Scripture is awfully useful. The greatest “wisdom for salvation” it gives us is precisely an increased trust in God. The more we lean on Scripture, the more we learn to lean on God, its author. Leaning on Scripture is a form of devotion to God’s grace. But as usual, the Gospel makes it most simple. In this week’s Gospel, we express our trust in God by storming heaven with prayer – like the widow, who wouldn’t leave the judge alone. God wants us to act. He works through us. But we lean on his grace by always begging for it, begging for his assistance. The saints are a great way to do this. Asking the saints to pray for us intensifies the sense that it is God who acts in and through us. We can be tempted, in our prayer, to think we’re just pumping ourselves up. “Lord, help me speak words of truth to this brother,” in our constant temptation to rely only on ourselves, can gradually fade into, “Come on, self, you can do this!” But no, we beg his grace. The battle belongs to the Lord! And so we ask others to pray for us, especially those most close to the Lord. Somehow that triangulation – bouncing our prayers off of someone else – helps us see more clearly that what we must rely on is his strength, not ours. Finally, both the Gospel and the Epistle teach us to look to his final coming. Again, meditation on the last day is a way to intensify for ourselves the reality of God. He will come! “He will judge the living and the dead, by his appearing and his kingly power!” The Lord lives! How do you experience this? Do you find yourself tempted to rely too much on your own strength? Do you have devotions that help you remind yourself to trust in him? We are getting to have a pretty big group of readers. Would anyone like to share in the comment section? “Creation retains its beauty which fills us with awe and it remains a good work. But there is also ‘violence, division, disagreement, war’. This occurs when man, the summit of creation, stops contemplating beauty and goodness, and withdraws into his own selfishness. 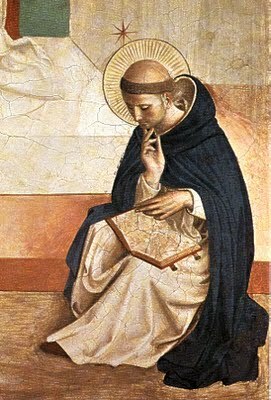 “When man thinks only of himself, of his own interests, and places himself in the center, when he permits himself to be captivated by the idols of dominion and power, when he puts himself in God’s place, then all relationships are broken and everything is ruined; then the door opens to violence, indifference, and conflict. . . .
“Can we say this: that from harmony he passes to ‘disharmony’? No, there is no such thing as ‘disharmony’; there is either harmony or we fall into chaos, where there is violence, argument, conflict, fear. Read the entire homily here.